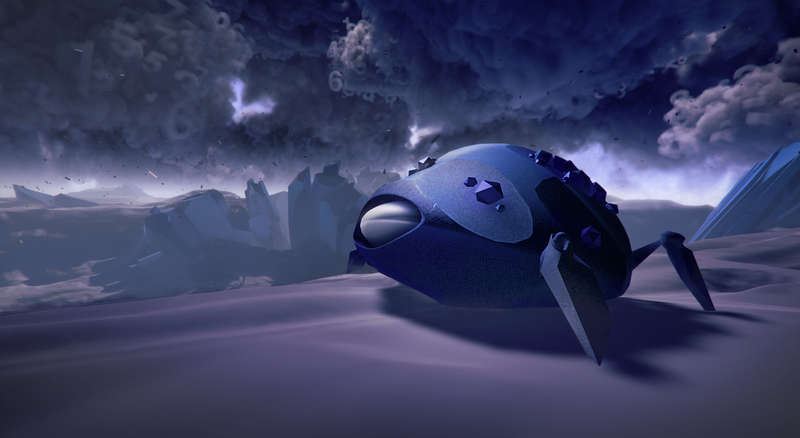 The debut title from Pixel Reef, the new studio founded by famed creator Eric Chahi. Hi! I am Eric Chahi, maker of Another World (Out of this World in US). 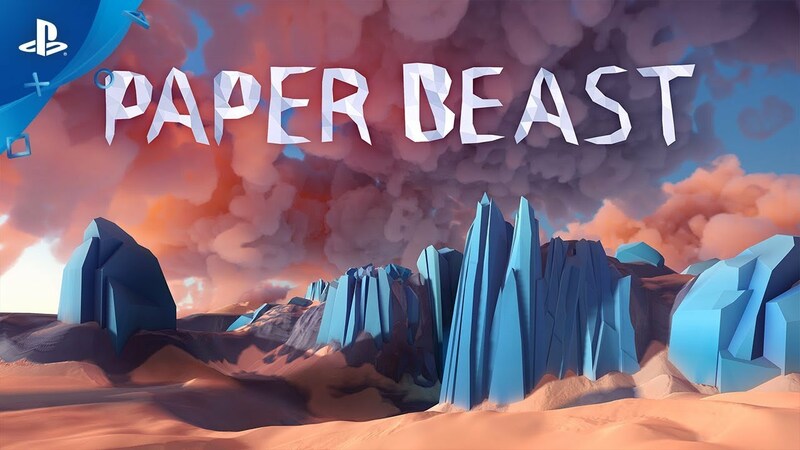 I’m thrilled to introduce you to our new game, Paper Beast, set for a release later in 2019 for PlayStation VR. Somewhere deep down in the vast memory of a data server, an ecosystem has emerged. Decades of lost code and algorithms have accumulated in the eddies and flows of the Internet. A small bubble of life has blossomed. Paper Beast is born. A few years ago, I was playing with physics in the Unity Engine with several cool new gameplay elements in mind. Notions of Big Data were swimming in my head. As you know, I’ve always enjoyed exploring new concepts and creative territories. That was my motivation when I created Another World (Out of this World) back in 1991 on the Amiga. To be independent and free to share my passion for exploring new experiences and technology, I created my new studio: Pixel Reef. The studio is like our atoll, our happy place — a space for creative exploration. With Paper Beast, we wanted to create a complete ecosystem with unique wildlife. We wanted to reproduce the excitement you might feel as an explorer discovering a virgin land, a place where no human has been before. When you watch animals in nature, you feel something special about how they move and react. They exhibit an intense sense of vitality that makes exploring all the more enriching. You will interact with the creatures and will start to form delicate bonds with them. So how did we incorporate this into Paper Beast? Every bit of gameplay is built atop a simulation covering every conceivable detail, from terrain simulation to animal locomotion. 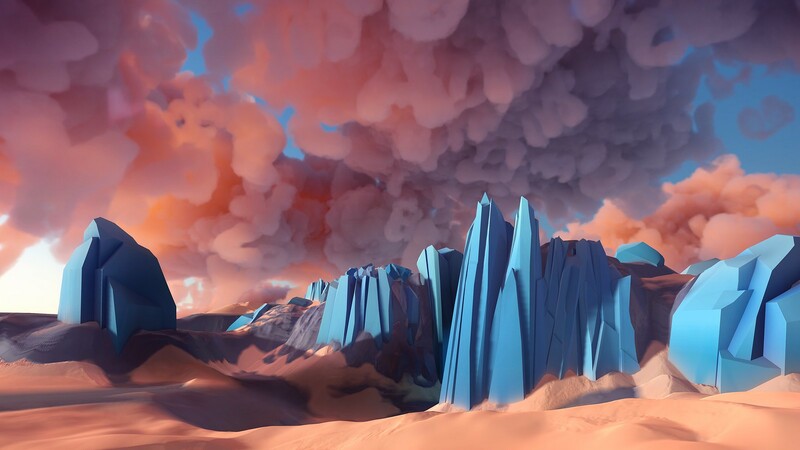 You can precisely interact with the environment as an immersive, playful universe. Creatures will adapt their behavior to how you, as a player, interact with the world. Paper Beast is not a god game, but we did put some key ingredients in it. 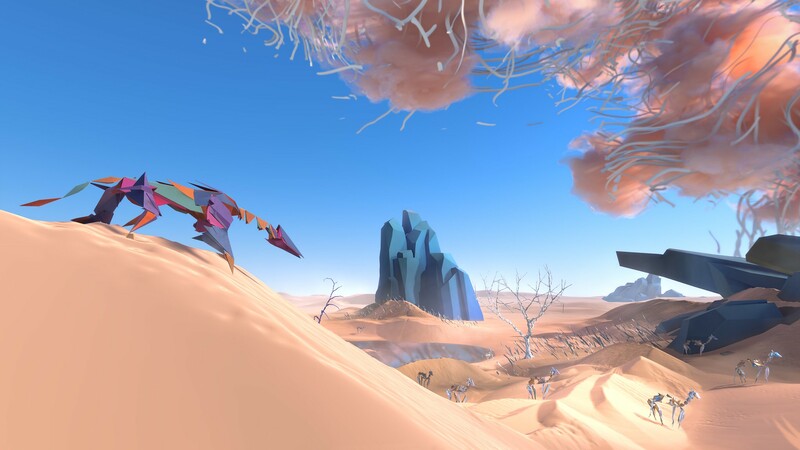 More than anything, Paper Beast is a virtual journey leading quirky animals through a colorful universe that sprouts from the remnants of the internet. We will tell you a story, but the narration is unspoken. Through the events of the world, their pacing, the story unfolds. Much like Another World, there is no text or dialogue. There is only the environment, and you will feel immediately connected to it. Our physics system enriches the experience through simple interaction and manipulation of the environment. We also wanted the environment to be meaningful and touching. The creatures you’ll meet, all made of paper, are the symbolic bridge between the world of men and the world of information technology. 3D immersion has always enthralled me: you can feel the environment around you in its entirety. With VR, your gestures are spatialized, so you can fall into a fully interactive, simulated living world. One of the VR lessons I learned during development is just how critical sound is for immersion. In movies they say that sound is 50% of a picture. Everything becomes so more tangible with authentic sounds. That is even more true in VR. Sound is 50% of space! At Pixel Reef, we have three people working full-time to deliver an outstanding binaural experience. We have been tirelessly working on Paper Beast for three years, and we think you’ll find our unique DNA in it. We can’t wait to share the world of Paper Beast with you, and we look forward to hearing about your own experience in the virtual world. We will keep you updated until the launch! This looks fantastic. I’m curious though what the gameplay will be like. I didn’t get a solid sense of that from the article. Do you just observe and interact, or is there an actual adventuring campaign? I remember playing the demo for that on the Amiga back in the day! It was pretty slick if I recall. I would love to learn a little more about the actual gameplay of this title however. It looks amazing I just would love to know what will keep me coming back for more after my first look around. Sweet! I played “Cruise for a Corpse”, “Heart of Darkness” (Best game soundtrack ever btw) and of course “Another World”. I cannot wait more products from you and I am thrilled that you are embracing VR. 2019 is shaping up to be the YEAR of VR for Playstation. Beautiful looking game. Thank you for pushing the limits and creating something unique!